We just got married, and we were very saddened by the Icelandic cloud of ash that kept several of our Danish friends from attending our wedding. But everything can be a blessing in disguise. We didn’t tell our caterer, Phil’s BBQ, so we ended up with extra beef ribs in the freezer. While we miss our friends, at least we have ribs. And as the old saying goes, “if life gives you ribs, make rib sandwiches.” And so here we are, summer just started, and this wonderful panini (thank you Scott and Choo for that wonderful machine!!) is our first and most basic beef rib sandwich. Yum. This is almost as simple as you can get. 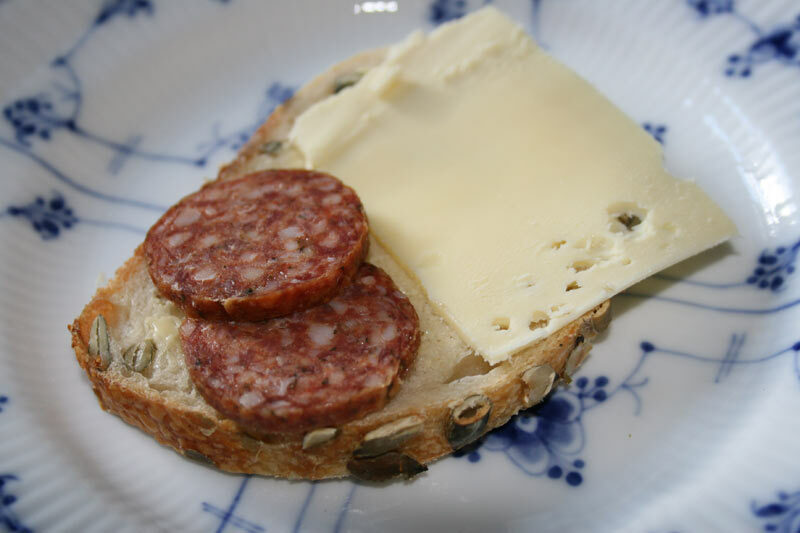 A Danish “thebirkes” with cheese. 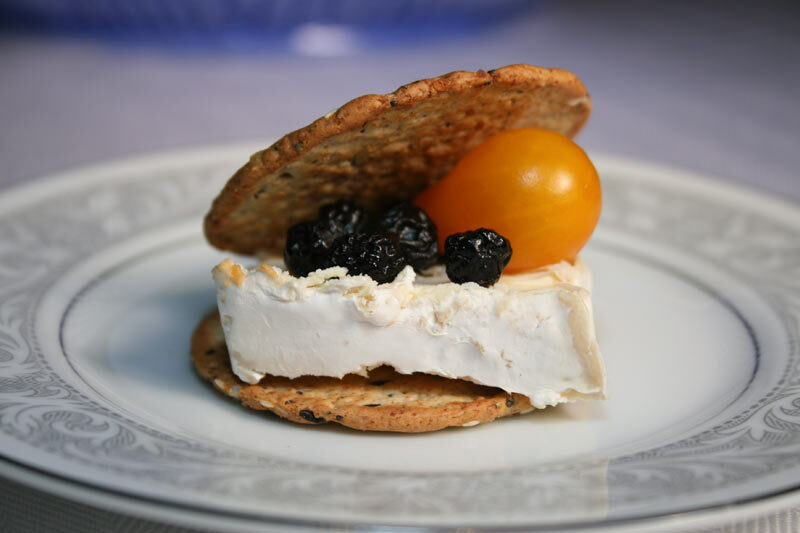 The cheese is called “Helge”, and that’s all there is to it. Very good, very easy, great for breakfast. Note: A thebirkes is like a very flaky croissant, with poppy seeds on top, and with a marzipan mix inside. Read more about danish pastries. A simple ham sandwich on dark rye bread, with melted cheese, onion and corn. The mustard gives it all a kick, and in retrospect perhaps we should have added a bit of freshly grated horseradish. If anyone tries that, let us know how it works out in the comments. This sandwich is highly dependent on the quality of the ham, so don’t be stingy. This here is our Jamaican Christmas ham, which is cooked traditionally with pineapples and lots of cloves, and works brilliantly for sandwiches and pizzas. Since we come from Jamaica and Denmark, this sandwich could be considered a cultural merger. The return of the 2009 Christmas ham is always joyful and filled with good memories. This time we unfroze a few slices for a sandwich, melt style (Meaning, lots of cheese on top). To meat-it-up, we also added some buffalo chicken from the local grocery store. Do you ever go through life, looking at the same thing over and over again, not really thinking about what it is, but still forming an opinion that sometimes turns into solid knowledge? This is the way I feel about Butterball buffalo chicken breast. I have seen it many times at the local grocery store, and never really given it a second glance. I knew, somehow, that this gigantic ball of chicken must be a chicken breast, after all that’s what it said on the package. Last week, I then decide to try it. As soon as I see the meat cut, I realize to my horror that obviously this is not a gigantic 10 pound chicken breast, but rather another conglomerate of pressed meats of unknown origin. I could have kicked myself, but the nice lady had sliced it already, so here it is. Contrary to what you might believe from reading the rest of this blog, sometimes we do enjoy the simple sandwiches. This one is about as simple as it gets: Bread and butter, salami and cheese. The only trick is to get good quality ingredients, freshly made bread, Italian salami with a great taste, and a fantastic cheese such as this Danish one called “Helge”. Yes, in Denmark cheeses have people-names. Go figure. Don’t even attempt this one if your bread is not fresh by the way, it will ruin your day.